Hello dears, I’m Nicky, enchanted to meet you! I am an elegant 2 year old girl with flowing black locks and an eye for style. I am looking to live in the lap of luxury and get pampered on a daily basis. In return I promise to be a fabulous companion that will cuddle with you through your favorite Rom Com and greet you warmly every day. I do well with other animals and people of all ages, although I hope to be the apple of your eye! Charmed yet? 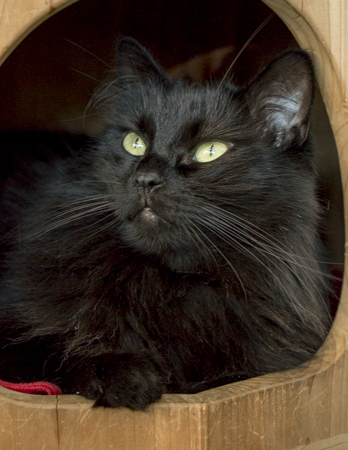 Come introduce yourself to me in the Pixie Project cattery where I currently reside. I am fixed, vaccinated, and microchipped. My adoption fee is $100.